Buying a tennis racquet for your kid(s) can be a confusing experience. What brand of racquet to buy? Which size should it be? Can he/she handle the weight? 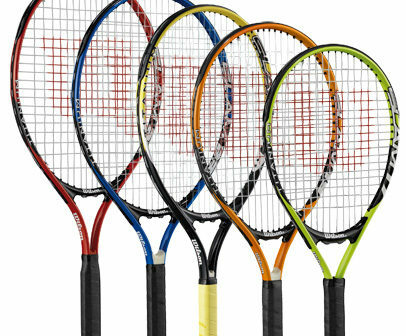 Tennis racquets come in various shapes and sizes. Also adults can try playing with extended racquets up to 28 inches for extra reach for example and there are quite a lot of professional players enjoying the 27,5 extended racquet length. An important tip: Make sure they are comfortable with the racquet they use. Any aches and pains are clear warning signals that the grip might be too big/too small or that the racquet is too heavy. Remember that you would need to get different tennis balls depending on the age/size of your child. Hitting a standard tennis ball can be quite overwhelming if you’re 7 hears old and wielding a 23 inch tennis racquet . Gamma has a nice selection of transition tennis balls for all ages and levels. You can also get a specific kids tennis net from Wilson called EZ tennis net . Good luck in finding the right tennis racquet for your child. Remember that having proper gear is important when it comes to getting a good start in the sport. And junior tennis racquets and balls are not as expensive as adult tennis racquets.